Remember the Time...A Stranger Called? (Halloween Edition) - Are You Finished Yet? The topic for this week’s Remember the Time Blog Hop (Halloween edition) is that time we were flippin’ freakin’ scared out of our minds…or anything else Halloween related. Unlike the last time we focused our nostalgia on fear, feel free to unleash your tales of ghosts, goblins, ax murderers, and real life horror. Now go find your security blanket and join me for my own trip down Nightmare on Elm Street. Sure, the supernatural is scary. Zombies and monsters send chills up the spine. But perhaps the most terrifying horror stories are the ones that could happen to anyone and require no suspension of reality to believe. That’s right! Little did the young girl know that just upstairs was a madman who had already murdered the little children and was patiently luring their babysitter to the same fate. And so goes the time-honored horror classic, When a Stranger Calls. The first time I saw that movie, I was in my prime babysitting years. Therefore, it certainly hit close to home. Little did I know exactly how close to home it would hit. It was a Saturday night like many of my early teen years. I was babysitting my cousins, and all three of them had gone to bed with little to no fuss. I had just poured myself a soda and was looking forward to watching some Saturday Night Live…maybe a little Showtime at the Apollo, depending on how late my aunt and uncle would be. I was sitting in the quiet house, when I heard something faint…something tinkling…something musical. I muted the television and strained my ears. It sounded like music box music. And it was coming from…upstairs. Now just like clowns and china-faced dolls, music box music is among the creepiest creations known to man. Don’t tell me you can hear a music box playing and NOT have visions of little Victorian ghost children who were poisoned with arsenic by their deranged nanny. That was exactly what I was thinking about as I stood at the base of the stairs, the wobbly lullaby wafting down, trying to seduce my curiosity. At this point in a scary movie, the audience is yelling, “Don’t go up there!” I was telling myself that, too. I had seen enough horror movies to know what happened next. But this wasn’t a movie. So I would be okay, right? I slowly climbed the stairs and immediately found the source of the music as I reached the top. In the hallway was a bassinet that the baby had grown out of. In it was a mobile, which was just winding down the lullaby that had been the source of all this creepiness. Maybe one of boys got out of bed and wound it up, I thought. Well, it couldn’t have been the baby. So I checked on the other two boys…who were both sound asleep. Or…maybe they’re DEAD! Totally freaked out by this point, I turn to go back downstairs and notice that the bassinet is right next to a closet. A closet with a door that is partially cracked open. It’s the only explanation. Some psycho killed the kids, hid in the closet, and then wound up the mobile, hoping the music would lure me into his clutches. There was only one thing to do: call my mom. I told her the whole story. I’m sure I asked her to come over. But she remained calm and tried to rationalize with me. My aunt and uncle had a security system, she reminded me. And if someone had tried to break in, the alarm would have gone off. I hung up the phone and breathed a sigh of relief. That made perfect sense. There had to be some other explanation for the music. Maybe when the mobile fell into the bassinet, it switched on. Maybe the mechanism had been stuck and finally came loose. Or maybe…the psycho had already been IN the house before my aunt and uncle set the security system for the night, and THAT’S why the alarm didn’t sound. I don’t know that I had ever been so happy to hear my mom’s voice. Although she quickly confessed to me that she had ALMOST responded to me by asking, “Have you checked the children?” Thankfully, she thought better of it, which was a good thing. Otherwise, she may have ended up the star in her own horror story as the mother who caused a fatal heart attack in her young daughter, all for the sake of a practical joke. 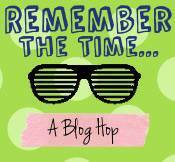 This post is part of the Remember the Time Blog Hop. You can join in, too! 2. Grab this badge and place it at the bottom of your post. 3. Add your link below and come back to see all the other great posts your blogging pals have written! Comment on them and tweet and share your favorites! The link-up closes at 11:59pm EST on WEDNESDAY (note the new deadline day with our updated RTT format), so get those links in before then. I loved when people got booed offstage. It always made my Saturday night. And yes, I think everyone has a creepy babysitting story. It’s a right of passage. We oldest boys had our share of babysitting for our siblings. I’m the oldest of 9 kids and it isn’t any less scary because we’re boys. My saving juicy rationalization was that I figured 9 ankle biters could probably take Jason or Michael. I had instructed my bro’s and sis’s to “attack” at my cue. Luckily for the stranger, he always chose some other poor schmuck! 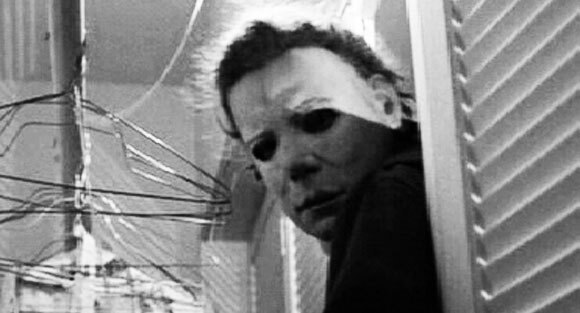 The movie Halloween, which I saw ON Halloween when I was 15 years old, scarred me for years… life! Great story!! Halloween is definitely one of the greats. Despite my scary babysitting experience, I have become a little obsessed with scary movies. I can’t get enough! Oh my goodness, just now reading this on Halloween night, I realized that you tapped into some of my realest fears I had as a teenager in this post. Babysitting was always a stressful situation for me anyway (I am one of those people who really only likes their own kid; the rest are all kind of rotten), so when I heard a creak in the house or the phone ring, I always felt like that night would be my last. I had a creepy incident once when I was babysitting too and I called my mom too, and she offered to come over. Moms are so good for this. They really are all angels. I called my mom probably all.the.time. I had a bunch of weird babysitting experiences besides this one. Once a sheriff came to the door and told me he had a warrant for the arrest of the people who lived at the house. I was like, “uh, I”m the babysitter.” And then I was faced with the dilemma of wondering who to trust. Was this guy a con artist or murdered in disguise…or was I babysitting for criminals who would kill me once they found out I knew about the warrant. So weird. The first time I saw that “Have you checked the children?” movie, I was 14 and I was actually babysitting at the time. And of course, while I was watching it…the phone rang! I almost died! It was all I could do to bring myself to answer that phone 🙂 Thank God it was only the baby’s parents. I changed the channel very quickly, I tell you! Maybe it should be against the law to let anyone of babysitting age see that movie. It sounds like it tormented a lot of us!!! Hahaha great story!! I am such a wimp when it comes to those sorts of movies for the reason that I KNOW I would freak out forever afterwards when alone in the house with the Little Mister! I love scary movies now. I still freak out when I’m home alone sometimes, but I just can’t stop myself! I’m the oddball here that never babysat nor am I a fan of scary movies. I’ve seen some but it’s not a genre that has much appeal to me. That said, this post was great, but it’s still not clear to me how the chimes got activated. Was it by the monster in the closet? I guess we will never know…mwhahahahahahahahahaha! Is that code for it happened so long ago, you really can’t remember? Yes, it rates right up there with where is Jimmy Hoffa buried? Hey Finished, Just a quick note to say I have nominated you for a WordPress Family Award. I will be posting about it shortly. Your blog is a class act! Mindfulmagpie. THANK YOU!!! You are too kind, my dear.